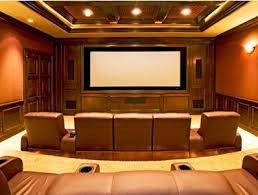 The key to creating a great home theater, is realizing that there is no cookie-cutter model of excellence. Your home theater should be designed to reflect your individual tastes and preferences. Not all home theaters are built for the same purpose--some are meant for families, some are meant for parties, some are meant for romantic evenings, and some are designed to combine these purposes. However, you will need to know just what you will be using your home theater for, when it comes to choosing the audiovisual equipment you install. 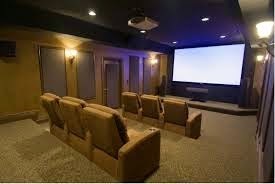 In this article, 4seating will look at what is required when choosing the right screen size for your home theater--and as you will see, the task is not as simple as it may first appear. The first thing to know for the novice, is that there are several screen size choices available. The aspect ratio, which is essentially the ratio of the height to the width, will determine what kind of picture you see on the screen. One of the most common aspect ratios is 16:9, also referred to as the sum of that division, 1.78. Most flat-screen HDTV's are in 1.78. Another of the most common aspect ratios is 2.4, which is used for projector screens. It's wider than a 1.78 and fits the aspect ratio that many current movies are shot and projected in. A third aspect ratio, just slightly wider than 1.78, is 1.85, which many other movies are shot in. The problem? There is no one-size-fits-all screen, that will completely eliminate the dreaded 'black bars' appearing when you watch certain programs or films. A 1.78 might be perfect for watching television broadcasts or certain kinds of films, but if you put in the DVD of a film shot in 2.4, you will see black bars appear on the top and bottom of the screen. Similarly, other films and television shows shot in 1.78 or 1.85 ratios will have black bars appear on the sides of a 2.4 ratio screen. Therefore, you must choose carefully, depending on the types of programming you think will dominate the screen time in your theater. 2.4 ratio screens offer a wide, dramatic panorama that is popular with those looking to most authentically replicate the movie theater experience. Since many current films are now shot in 2.4, this cinematic choice would make the most sense for those not planning on watching a lot of 1.78 ratio TV content. 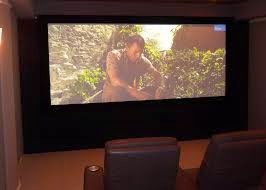 However, the size of 2.4 screen you choose may be limited by the size of your home theater; a smaller theater will not accommodate a large screen (and the same can be said for 1.78 or 1.85 ratios). Which leads us to the next consideration: once you have chosen a preferred aspect ratio, what will be the size of the actual screen, and how far should it sit from your seats? The distance you sit from your screen should take into account the aspect ratio; generally speaking, 1.78 screens require a few feet further distance, as their height is more of a strain on the eyes. Beyond that, you will want to think about just how far you usually like to sit in a commercial movie theater--do you prefer to sit in the front, middle, or back? It might actually be a good idea to gauge the ratio of your preferred seating relative to the size of the theater, and translate that to the size of your home theater. Always keep the screen at eye level, as keeping it higher than that will result in neck and eye strain. In this sense, the placement of your theater seats will be just as important as the placement of your screen. When you've done the calculations, actually sit in your seats to make sure you have the right distance, and then adjust accordingly if needed. Finally, be sure to take into account room for outside speakers and theater curtains to flank your screen, if you plan on having them. Stay tuned for Part 2 in our series, which will go over choosing the right audio equipment setup for your theater.